How small is small? What volume of seawater is large, stable enough to suit you, and some modicum of livestock, but not so tiny as to crash at barely overfeeding, electrical outage, or unnoticed death of a tankmate? How little does it have to be before you call a marine system "small"? To Shamu an Olympic pool is teeny; to me a small marine tank is forty gallons. Anything smaller is too limiting in what you can practically keep in it, and way too unstable to suit me. Yet, I've seen "successful" two, five, ten gallon outfits. I mean maybe all they had alive in them were a Condylactis anemone, a shrimp and a damsel; but they were alive. Whether it's done to show off, experiment or for lack of funds, space, or portability, "micro" saltwater systems of all types are possible, just not very safe or practical. When setting up a working facility, like a retail outlet or holding facility, principal consideration is given to what size to make individual systems. Let's take for example a nominal ten gallon tank (20 1/4 X 10 X 12") and a fifteen (24 X 12 X 12"). Unless you see these aquariums side by side, most people can't tell which is which. Guess how much more "life" the fifteen can hold than the ten? I can hear those wheels grinding, "Well, let's see A is to B about 1.5 times so my answer is one and a half as much." Actually, a fifteen gallon tank can and does safely house about twice as much as a one-third smaller ten gallon tank. Livestock: Obviously whatever is placed in a little marine system should be and stay small. Not so apparent are considerations of feeding, metabolism and space-compatibility. Due to restrictions and efficiencies of proportion, selecting organisms that can be sustained on the same, little or no supplemental feeding is a premium. Some folks scarcely feed their tiny-reef set-ups, relying on what's "growing there" to largely supply nutrition. The more types and volume of foods you're compelled, or foolishly apply to a small marine system (because it is being "fed" to the whole set-up, not just the intended livestock), the greater the likelihood for pollution. Space-compatibility refers to the proximal requirements of and between species. Stinging-celled animals (corals, anemones, et al. ), sponges, and echinoderms especially pose possible difficulties in crowding to the point of touching. Study before installing. Being careful about what you buy, and making sure it's fit, and not bearing a latent biological disease is critical in small volumes. You may not be able to treat your livestock at all. Small systems are put together in pretty much the same way as larger ones, with special emphasis put on diligent testing and patience in stocking. Promoting nutrient cycling is best accomplished by one of two methods. For those with access to an established system (ask your dealer or buddy hobbyist), clean, bacteria-established gravel (if you're using such, with an undergravel filter) may be "bulk-transferred" to the smaller tank/bowl. Alternatively, simply employing loose-fitting live rock with or without gravel and/or non-live base rock is a real possibility. Should incorporate full-spectrum fluorescents or compact fluorescents whether you intentionally are stocking photosynthetic organisms or no. Any number of these may be worked into a hood arrangement. Some writers have suggested that halide lighting might be employed on small systems; this is definitely not recommended. The waste heat and propensity for burning the livestock in small volumes precludes the safe use of other than fluorescent lighting modes. Even fluorescents' effect on temperature must be monitored and controlled. Filter types used run the gamut from "none" to wet-dry plus. I will go on record as only sanctioning the keeping of tiny marine systems with the use of at least some outside power filtration and a working protein skimmer. As you'll be using pre-popped gravel and/or live rock, get your skimmer up and running from day one. Feeding is a, maybe the, most critical area determining the success/failure of tiny marine aquariums. Do not overfeed; in particular with foods that will quickly pollute the system. Frequent, regular, and with conditioned, pre-mixed water. Ideally, if you have a "normal" larger set-up you can use the water from it for changes in the smaller unit(s). Be religious about water changing; if you can a quarter to third a week. Altering water make-up, pouring in "adjusters", supplements in small systems is unnecessary and dangerous. Enough "trace" material comes from feeding, substrate interaction and water changes to keep the system in dynamic equilibrium. I can't for the life of me, understand, or at least agree with authors who have encouraged the general hobbyist/public to attempt small aquaria for marines. Maybe like adults who have forgotten how it was to first tie their shoes or ride a bike, they can't recall how hard it was to learn what now seem like simple tasks; or the frustration, sense of helplessness in losing livestock. Maybe they're trying to impress someone or make a sale? The same writers who advocate small marine systems as a "bargain" likewise list halide lighting, wet-dry filters, Redox testing... for them, costing hundreds of dollars, as well. I place blame for such simple-mindedness, "Anyone can keep marines in a drum bowl", in part for the pathetic level of participation in marine aquarium keeping and it's sophistication in the West. By prompting aquarists to participate in an enterprise so fraught with loss, hobbyist attrition is promoted. Small, (less than forty gallons, really) systems are a bad gamble for all but the advanced aquarist, who will put the effort into testing and adjusting for water quality and organism interaction, and has the facilities to move, rescue these systems as they crash. If you are going to still try your hand at a small marine set-up as your first, or only (and probably last) saltwater aquarium, I remind you to be on guard for temperature fluctuation and over-feeding ill-effects. 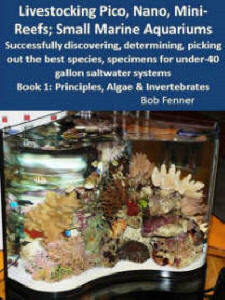 No matter what any and everyone else might write, bigger is better in marine aquarium size. Birdsell, Ben. 1985. Doing saltwater up small. FAMA 1/85. Jenno, A.J. 1976. Small marine aquaria. Marine Aquarist 7(2):76. Miklosz, John C. 1971. The small aquarium, parts 1-3. Marine Aquarist 2(3,4):71, 3(1):72. Miklosz, John C. 1973. Starting and maintaining the small aquarium. 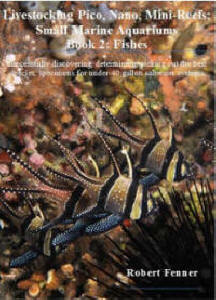 Marine Aquarist 4(5):73. Miklosz, Joan A. 1975. Starting small. 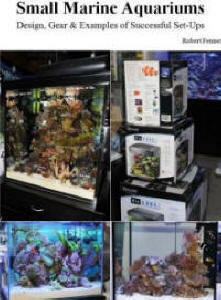 Marine Aquarist 6(2):75. Paletta, Michael. 1990. Reef invertebrate feeding. SeaScope Vol. 7 Summer 90. Shute, J.R. & John Tullock. 1993. Starting a small marine tank. TFH 7/93. Sprung, Julian. 1992. Micro-reefs, parts I, II. SeaScope Vol. 9 Spring & Summer 92.